Echoes, Women’s Caucus for Art group exhibition celebrates the renewal of the Boston chapter of the Women’s Caucus for Art. 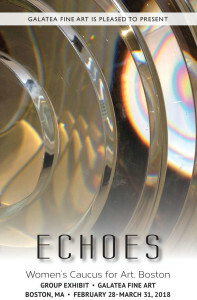 The work illustrates the resonance and richness that echoes can reveal in our changing lives. This theme is especially relevant with the resurgence of feminist activism – the so-called “third wave”. Feb. 28 to March 31, 2018 at Galatea Fine Art, Boston. 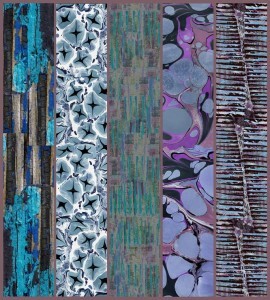 Opening reception during SOWA’s first Friday, March 2 from 6-8pm. 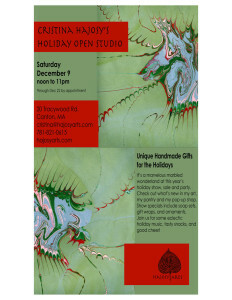 Come celebrate the season at Cristina’s Holiday Open Studio all day at her home studio in Canton on Saturday, December 9, 2017. 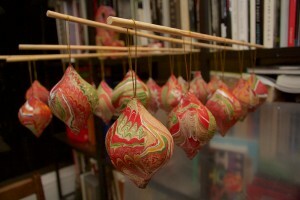 It’s a marvelous marbled wonderland with unique gifts, tasty snacks and an eclectic soundtrack of holiday tunes. Come celebrate the art and the craft of textile arts at this Saturday’s Fort Point Channel Fiber and Fabric Arts Fair hosted by the Friends of the Fort Point Channel. Atlantic Wharf, 290 Congress St., Boston from noon to 4pm. 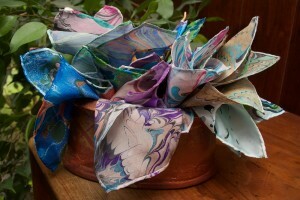 Cristina Hajosy will feature her marbled fabrics, pocket squares, ribbons and more! Get your creativity flowing this Spring with Hajosy Arts! Join Cristina in her private art studio for workshops in Marbling, Paste Paper, and the Book Arts. One-on-one art education and group classes for teens and adults of all skill levels provide a relaxed, welcoming, creative environment to explore Mixed Media Arts. Schedule your own “Art Playdate” at the times that work for you, or register for one of the upcoming workshops. 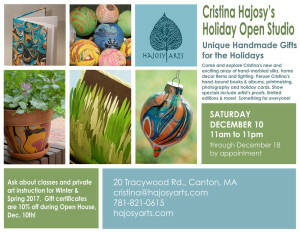 Cristina Hajosy will be opening her home and studio on Saturday, December 10, 2016. Join her for some holiday cheer and an opportunity to get some of your holiday shopping out of the way while supporting a local artist!